13. BBX Threatens – Sue Me PLEASE! BBX International CEO Carolin MacDonald has issued me with a NOTICE TO CEASE AND DESIST PUBLICATION OF DEFAMATORY MATERIAL, and threatened to take me to court. Talk about being away with the fairies! Here is a copy of the warning notice and my commentary. Sadly, this will yet be more BS talk from the masters of . . . well you get the picture! Grab a beer and popcorn, then enjoy . . . When in a hole . . . stop digging! Sage advice not heeded by the writer of this letter. Let’s look at a few things here. First, it is my stated intention to have BBX in court. I predict that Carolin MacDonald will have her apparent wish for BBX to be in court, perhaps not quite like she expects however! Secondly, apart from generalised statements that I have published something “defamatory” it is impossible for me to respond to this demand in the affirmative. Which statement is she referring to? All of them? Errr . . . defamation laws require the complainant to be specific. Did I spell her name wrong or was it that I offered an opinion (which BTW is not defamation)? 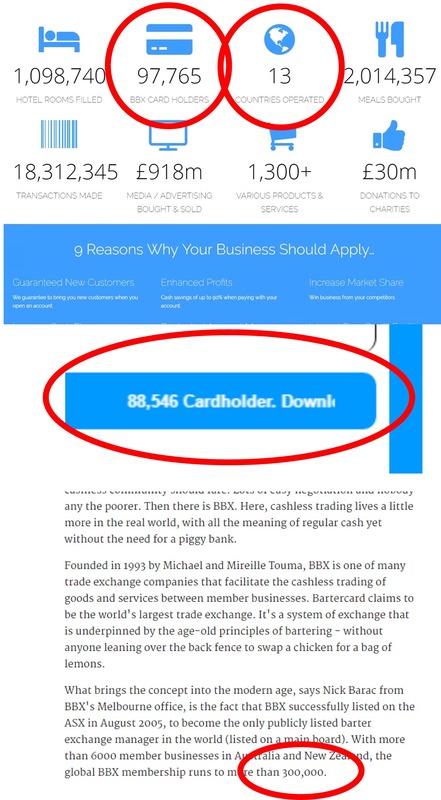 Or did I get something factually wrong like stating that BBX claims 88,000 cardholders when they actually claimed they had 97,765 cardholders in one location, an insane 300,000 in another and currently report 88,546? Considering that the ACTUAL membership using IRTA’s own rules is less than 10% of these figures . . . ummm! Perhaps it is the fact that they report a presence in 13 countries but I only can find evidence of eight, and six of those have serious credibility issues? Fourthly, my personal motivation is very definitely about me. I have a stated aim to be seen as a credible, thought-leader in the industry, fearless to take on fools who attempt to deceive and manipulate others for personal gain. If the consequences of this exposure is brand damage for the crooks of the industry then so be it; if the cap fits, then wear it. I believe that Carolin is inexperienced in a management role, unfit for leading international operations for ethical and personal reasons and is totally unable to take advice. First from what I’ve been informed, she rarely seeks it; secondly when she does get it she ignores it and mostly she can’t afford it. Note also that this communication from BBX International has not come from a lawyer – telling! I doubt any lawyer on the planet would have written something so amateurish let alone approved it for issuance to an investigating blogger currently exposing the reality of her family business. We refer to the above matter and to the domain name known as “dennis.co.nz” (the “Domain Name”), which is registered to you and is at all material time under your control. It has come to our attention that you have published or caused to be published numerous posts containing defamatory material against BBXI since 10.2.2017. We vehemently deny each and every allegation contained in the above web pages as they are either inaccurate, false or untrue and such a compilation of misinformation can only be a product of poor investigative research and critical analysis on your part. 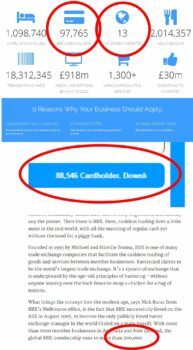 Your reckless publications have caused severe reputational harm to BBXI as well as damage and losses to BBXI’s business worldwide. Furthermore, you are in complete disregard of the interests of the individuals that have worked hard to build up BBXI’s business from the ground up as well as the members of the BBXI community who rely on member participation in their day-to-day business. For your reference, kindly find below a reproduction of one of your statements to us for context: “Putting it into a nutshell crudely, it’s all about me.” We strongly disagree. TAKE NOTICE that BBXI hereby demands that you remove all publications listed above and any other publications on the above Domain Name or any other domain name, or through any other means whatsoever, which contains defamatory statements against BBXI immediately. TAKE FURTHER NOTICE that you are to cease and desist from publishing or causing to be published any further defamatory statements against BBXI through the Domain name or any other domain name, or through any other means whatsoever. AND TAKE FURTHER NOTICE that in the event that you fail to accede to our demands, weshall hold you fully liable for all damages and loss suffered by BBXI as a result of your defamatory statements. In the event that you fail to comply with the above, you will certainly be subjected to perilous and protracted litigation. In the meanwhile, BBXI reserves its rights against you. I stand behind every word I have written and endorse them ALL (all 30,000+ of them) personally. Carolin, you have the full right of reply, and have not exercised it. You refuse to talk to me and answer simple questions. When you did speak to me you were evasive and attempted to deceive. I believe that you also lied openly on the record as CEO of BBX International. I believe that (depending on the jurisdiction) you have committed criminal acts and knowingly at that When justice catches up with you, you will be sure to be staring at concrete walls. Only a fool ups the stakes like this when they are being exposed. You do not understand either your adversary, nor the true seriousness of your situation nor do you have any real grasp on reality. The “Touma family would never do that” meme is and has been totally busted, forever. Your company will shortly have no access to the mainstream banking world as Credit Card companies take action to protect their and their clients interests. You have thousands of Credit Cards, Expiry Dates, CVCs and even PINs exposed to multiple staff members in multiple jurisdictions which is criminal conduct and totally against every rule in business. As such you are guilty of reckless and criminal negligence as a director, especially knowing as you do that your father was warned repeatedly of not only the facts, but the significance of this major security lapse. You do not deserve to be in business nor have the credibility to manage the financial affairs of the people and companies that you do, and you will lose it under the lights of truth. Like the cockroaches that flee when the lights are turned on, I believe that you are being shown for who you really are as day after day more is coming out about you (personally) and your business. Your empire has been disintegrating around you with India, Malaysia, Thailand, Singapore, New Zealand and most likely shortly the UK either pulling out or dead or dying. Your Australian Franchises have been described as wicked, corrupt, criminal and at the very least incompetent. You and your family have debts, liabilities and personal exposure through the roof with imminent expulsion from IRTA, who I can assure you, as the information and facts surface, will swallow a dead rat and surely distance themselves from you and your company that has been built on hot air and BS. BBX International is a disgraceful blight on the business community and an embarrassment to the barter industry globally. Please Carolin . . . please don’t threaten me. Please just sue me personally, immediately, so that everything I say can be tested and proved in a court of law. I’ve never lost a court case in 42 years of fighting crims, crooks and crazies like you. You won’t be challenging that record, I can assure you! Unfortunately, I don’t believe that Carolin of BBX International will ever sue me for defamation. In my next post in this series, I show how the knives are coming out and I provide proof from within, that BBX International has very serious problems, not-the-least being dysfunctional management.